Has Wisconsin's Well-Worn Road Funding Debate Finally Reached A Turning Point? Wisconsin's transportation fund has reached a point where there are more road projects than there is road funding, a day of reckoning that’s been a long time in the works. Lawmakers and governors have ignored repeated warning signs and put off the toughest decisions on roads, a cycle that began at least a decade ago. For lawmakers inclined to increase funding for transportation, there have been no shortage of ideas over the years. Back in 2006, Port Washington Republican state Rep. Mark Gottlieb chaired a special committee on transportation known as the "Road to the Future Committee." The panel was formed by GOP leaders after the state Legislature voted to end the automatic indexing of the gas tax, a law that funded Wisconsin’s transportation projects for decades. Gottlieb’s committee produced a report that explored new ways to fund roads. Its recommendations included a variation of the gas tax and a variety of vehicle registration fees. "Revenue is obviously always going to be the most challenging thing here," Gottlieb said at the committee’s last meeting in 2006. The panel was disbanded unceremoniously. Its funding recommendations went nowhere. By 2013, Gottlieb was Gov. Scott Walker’s state Department of Transportation secretary. He chaired another special committee, this one known as the Wisconsin Transportation Finance and Policy Commission, which was created by the 2011 state budget. That panel also produced a report exploring new ways to pay for roads. "Transportation fund revenues available over the next decade will be inadequate to preserve the current condition of our network," Gottlieb warned at the 2013 press conference announcing the commission’s findings. This report again explored raising the gas tax or registration fees, suggestions rejected by Gottlieb’s fellow Republicans almost immediately. Two years later, the Legislature's budget committee ordered Gottlieb's DOT to produce yet another report on road funding, and when it was released in late 2016, it also suggested possible tax or fee increases to pay for roads, including a return to automatic gas tax indexing. Another report released simultaneously suggested Wisconsin could alleviate some transportation funding issues with toll roads. Two days before the reports were released, Walker’s office announced without fanfare that Gottlieb, the longtime advocate of increasing road funding, resigned. 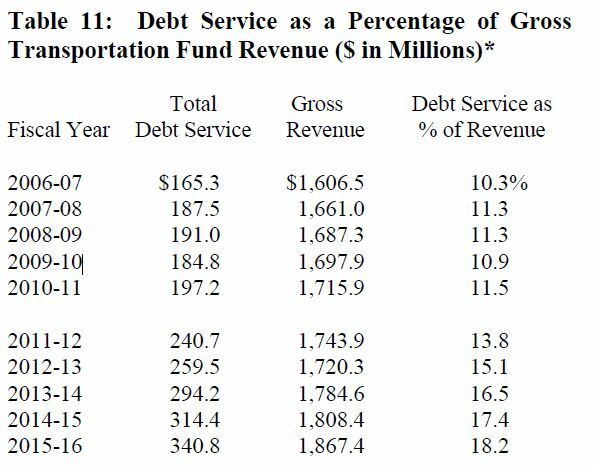 While Gottlieb’s reports were focused on revenue, others have scrutinized the state DOT’s spending. An audit of the DOT released in early 2017 revealed the cost of 16 ongoing highway projects had more than doubled since they were approved, resulting in cost overruns of $3.1 billion. It also found road conditions in Wisconsin had gotten worse over the last several years, especially on smaller state highways. "This is a very consequential audit that points out a number of problems," said state Sen. Robert Cowles of Green Bay, one of the Republican co-chairs of the Legislature’s Audit Committee. The audit injected new information into a transportation funding debate that was already well underway, but it was hardly the first time the Legislature had been warned of cost overruns at the DOT. A 2003 audit made similar findings. "Is the agency ever going to get real about what dollars they have and what dollars they can spend if we don't deny them a few dollars?" Cowles asked during a speech on the Senate floor in 2005. "I don't think so." The state didn't cut DOT spending, and even when Democratic Gov. Jim Doyle used the transportation fund for other expenses, he borrowed money to partially repay it. After Republicans took complete control of state government in 2011, Walker used his first ever State of the State address to attack Wisconsin’s reliance on borrowing. "These are no longer options," Walker told the state Legislature. "And their use has only delayed and worsened the difficult decisions we must now make." But with Walker steadfastly opposed to tax or fee increases to pay for roads, he borrowed too, and by 2015, debt had gotten high enough that Republican Assembly Speaker Robin Vos was pushing back. "I mean if we're not going to create any new revenues, maybe we don't have any new bonding," Vos told reporters, suggesting Wisconsin could quit borrowing cold turkey. The state ended up borrowing $850 million for roads in that budget, and this year, Walker and Vos are sparring over transportation taxing and bonding again. By the end of the last fiscal year, Wisconsin’s Legislative Fiscal Bureau found the state was spending a record-high 18.2 cents of every dollar of transportation revenue to pay off old borrowing, a number projected to grow even higher in the next budget. While the Legislature will still have a say in what the final transportation budget looks like, there are signs Wisconsin has finally hit a turning point when it comes to paying for roads. Walker is delaying and even cancelling some major road projects, and his new transportation secretary has a different mindset. DOT Secretary Dave Ross told lawmakers at a hearing on the recent state audit that there needed to be a "culture change" at the state Department of Transportation. Unlike former Secretary Mark Gottlieb, whose background was in civil engineering, Ross comes from the furniture upholstery business. As mayor of Superior, he was also an outspoken opponent of taxes at tea party rallies. When Ross questioned the need for some proposed highway projects at a recent audit committee meeting, it resonated with groups like Americans for Prosperity-Wisconsin, which has sided with Walker in this year’s transportation debate. AFP-Wisconsin state director Eric Bott said Wisconsin’s transportation budget issues are driven by too much spending, which he blames on Wisconsin’s road building lobby. "I think for far too long, certainly probably the last 30 years, there’s been an assumption in Madison that the road builders were the most powerful lobby," Bott said. "That may have at times come to the detriment of the people, certainly the taxpayers." Road builders are talking about project cuts, too, but as a warning of what will happen as the state does nothing. They’re hopeful the state will agree on new revenue, despite Walker’s objections. "Transportation, historically, has been a bipartisan issue," said Pat Goss, executive director of the Wisconsin Transportation Builders Association. "I’m confident that if there were an opportunity, we could have bipartisan support for transportation." This story is part of a WPR series on transportation funding that explores how we got here and what happens next. Read part one, two and three and four.